Have you found a planner that you love? Do you feel organized for your school year? Ok, I’m going to admit that I’m struggling hugely this school year. I can’t get it all together. I’m utterly falling apart and I feel like I’m running in about a million directions at once. I’ll share what I’ve done to help me get a grip this school year and maybe it will help you. I decided to go back to the basics and get organized in a super simple way. Nothing fancy. Nothing crazy. I’m not going to buy an expensive but pretty planner that I won’t fully utilize. I’m not going to spend time trying to modify a planner and make it work for me. Nope. I’m making my own this year. 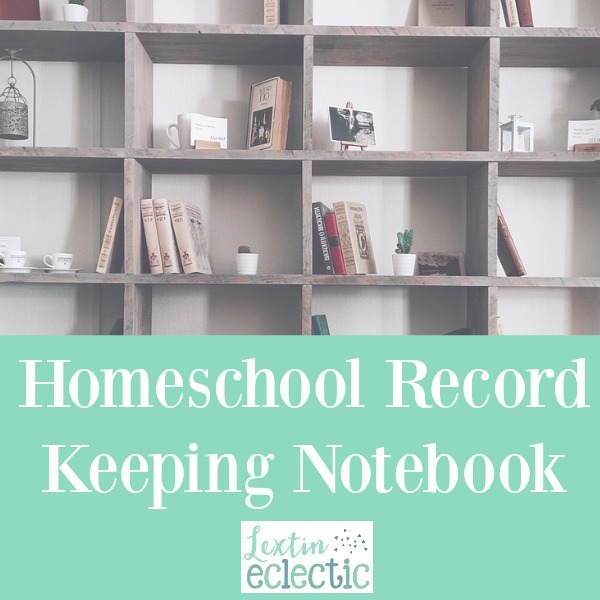 I’ve created a Homeschool Records Notebook to help me stay organized and on track this school year. If you’d like the printable version of these my notebook, but sure to visit the link below and make your own record keeping binder! I created a bunch of sheets to go into a notebook. See. I told you it wasn’t fun or fancy. I have only the pages that I need and will use. These are all pages that will help me plan my year overall and will help me stay focused and on track. This notebook is to collect and organize all of my thoughts, ideas, and curriculum lists. You know what this notebook isn’t? It’s not a place to have daily written lesson plans. I don’t even write those! Ah! Can you believe it? Instead I do more of an overall plan and then each day I just do the next thing. It’s kind of wonderful how timesaving and freeing it can be. Maybe you need a master record keeping binder. If this sounds like you, then read on and see the list of categories and pages that I have in my binder. I have a calendar that has all the months/days of the school year. I’ve circled weeks when I know we’ll take a break and I’ve circled all major holidays. This page gives me an overview of our school year. Instead of doing daily planning, I give myself a broad overview of my year. I count the number of lessons in each curriculum and figure out how many lessons per week we need to complete in order to finish each program by the target end date for our school year. It’s so much simpler than writing daily plans! This page has a spot to write notes for each month. I record things like yearly community events, holidays, or any activity or special event that is held in a specific month. That way I can better plan our field trips and school days each month if I know there are certain events we don’t want to miss. I always create a daily schedule for a regular homeschool day to help us stay on track. Our Fridays are sometimes reserved for field trips or for extras like art and hands-on-projects. So our Fridays usually have a different schedule than our other 4 days of school. My kids have begun to get into a routine with more exercise and they’ve been trying to find more time to work on their projects and hobbies. I’ve been helping them develop new routines to get more done and find more time for the things they enjoy. I have a morning, afternoon, and evening routine that has helped me be more productive. And yes, I have to write it down to help me stay accountable. To keep my menu planning simple and streamlined I have a different category of meal for each day of the week. For example, we always have a pasta type dish on Wednesday and on Monday we always have a Mexican-inspired dish. This method helps me have a better variety of meals each week. It’s really difficult to keep a clean house and homeschool so I’ve created some simple cleaning routines to help us clean each room in the house on a weekly (or monthly) basis. As part of my record-keeping, I create a list of curriculum that I typically use in each grade level. I also create a reading list for each grade level. This helps me keep all of my books organized. These are all of our read alouds for each year. Because we enjoy using living books, I try to create a book list for some of our other subjects like history and science. My kids love to read and I have to be prepared with book ideas for our various subjects. This is my price comparison sheet where I can compare the cost of curriculum from the vendor, Amazon, Rainbow Resource, and Christian Book. I keep this list of curriculum that I need to purchase and I check it off once it has arrived on my doorstep. No more double purchases! Ooops! I usually purchase most of our books for the school year because I forget to return books to the library. Therefore, I create a master purchase list of books for the year and watch for them to go on sale and then I check them off as I buy them. I’ve been having my kids track which books they read for school and for fun. By the end of the year they have a really impressive book log! I’m starting to give grades to my older kids for a few subjects, so I keep grade tracking sheets in my binder so I can jot down their scores. My kids each have a checklist for their daily independent work. I keep a master copy of each list in my binder so I can know what work they need to do each day and I can check in on their progress. Because my kids love to lose chore lists, I keep master copies of their lists in my binder as well. Now I can check to make sure chores are done. We do standardized testing every other year, so when we get our results, I stick them in this binder so I can see how their results change over the years. This is our page to log all of our field trips for the school year. I love seeing where each year takes us – and I’ve noticed we spend a ton of time at our Children’s Museum! I am always hearing about neat places we should visit (and then promptly forgetting what they were). Now I have a page to write down all of my wonderful field trip ideas so we can plan our next adventure. I keep a list of what activities my kids participate in each year. It’s funny how quickly you forget when they started a specific sport or activity. Now I have a record! Whenever I hear about a fun activity or a club my kids might enjoy, I jot it down on my idea page. This helps me plan for future years because I know what events are offered in my community. I am finding that I enjoy outsourcing a few classes each school year and I keep a list of different online classes that are offered. There are lots of options for homeschoolers! I’ve also discovered quite a few places in my community that offer classes for homeschoolers – especially at my local library. I try to write down what types of classes are offered to help me plan for future years. Call me crazy, but I’ve written down a curriculum progression that lists what programs and curricula I think I might use for each subject for preschool all the way through high school. Yes, it gets changed often, but it helps me to see the bigger picture as I make our yearly plans. I’ve also taken my curriculum progression and written it down by grade. This helps me see what subjects we’re covering each year. I’m always finding wonderful new-to-me homeschool curricula options, so I keep a running list of curriculum that I want to research. I admit it – I do have a curriculum problem! But now I keep it organized in my binder. I keep track of what classes my kids might take for high school. I’ve created several drafts of a proposed course list for my oldest. I know my plans will change about a million times, but it’s been fun to see them take shape on paper. I’m hoping that high school planning will feel less overwhelming because I started planning early. I printed off the required credits for graduation for my state to help me stay focused as I plan for the future. Yes, high school is only a few years away for my oldest. I’ve printed a few sample transcripts to help me get an idea for what a high school plan might look like someday. I’ve really created is more of a record-keeping notebook that I can use each year in my homeschool. At the end of the year, I can move the pages from this book into a larger binder that has a tab for each school year. Now I have a big binder of records from each school year. I don’t write lesson plans and I’m finally admitting to myself that I don’t need a fancy planner. I’m just keeping it simple – organizing my records and my lists. What about you? Do you write daily lesson plans or do you have more of a homeschool master plan notebook? What would you add to this notebook? Looks like you covered everything and I like how you made your own planner and will be downloading it as I like how I will be able to print out more of the pages and that we need and not have a planner with pages that don’t pertain to us. Plus. this is cheaper than the ones we found in a store. Thank you for creating it and have a Blessed day. Glenda Cates recently posted…Are You Looking For Blog Hops? You’re welcome! I hope you find it helpful! I’ve found it very cost effective to create my own planner and just print the pages I need. You always have the best ideas! Thanks for all of the tips and inspiration! My kids are in public school so I honestly didn’t realize the sheer amount of work that goes into homeschooling! Your organization sounds ideal though with all bases (there are than many bases?!) covered. The high school plan is brilliant, and the credits towards graduation. I’m impressed. Thank you! Homeschooling is a huge undertaking and I’m trying to do it well. It’s a fun adventure and I have a lot of respect for all the teachers who have to juggle the needs of a classroom of students! These are so great! I”m trying to get ready for the homeschool year and looking at all we need to keep organized. Thank you! I hope these ideas help! Thank you!! I hope you have a great school year as well! Love the pages you created! It’s always important to stay organized.